Shopping for a new Volkswagen Atlas? Late to the party; will buyers discover it? If you want all-wheel drive, you'd better be happy with the V-6. The 2018 Volkswagen Atlas does little wrong, but it's light on personality and a little low-rent inside—and it guzzles fuel. It's worth a look, but mostly rivals do more for less. We've knocked it down for its lackluster fuel economy not offset by particularly impressive performance and for an interior that feels low-rent compared to virtually all rivals. On the flip side, it's exceptionally roomy and versatile inside, and its conservative looks should hold up well. 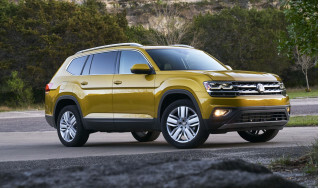 Unlike VW's previous crossover efforts, the Tiguan and the Touareg, the new Atlas is a decidedly American-oriented model, so much so that it is built in Chattanooga, Tennessee. Now, VW has been down this road before with its Passat, which was also designed for Americans and is built alongside the Atlas. While the Passat hasn't exactly been a hit, the Atlas shoots for the fast-growing crossover SUV segment instead of the slowing sedan market. 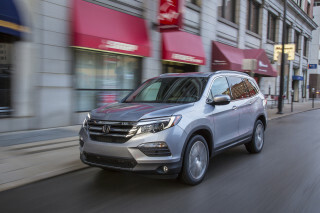 The Atlas is offered in five trim levels and with a choice of 2.0-liter turbocharged 4-cylinder or 3.6-liter V-6 engines mated to either front- or all-wheel drive, but only the V-6 can be ordered with winter weather-friendly AWD. 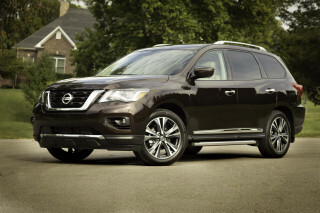 At just shy of 200 inches from head to toe, it's on the large side compared to its rivals, which includes the Toyota Highlander, Honda Pilot, Ford Explorer, and Nissan Pathfinder. Stylistically, the Atlas shares more in common with the five-seat and more Euro-oriented (and pricier) Touareg, although its flared fenders and slightly more angular overall look have a lot in common with the Jeep Grand Cherokee. Full LED headlights are standard on even the base model, but LED taillights are on the options list. Inside, the Atlas' dashboard could easily have been lifted from the Passat. VW's Car-Net infotainment system takes center stage on the dashboard and it's flanked by a pair of large air vents. The megabuck SEL Premium offers a full LCD instrument cluster, which displaces with conventional gauges in favor of a multi-configurable screen. All three rows of the Atlas offer better-than-average interior room. 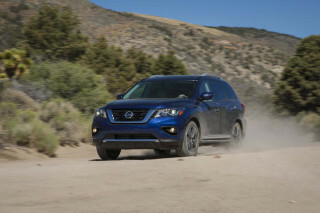 The second row slides fore and aft as in most competitors, but the Atlas joins only the Pathfinder in allowing a child seat to remain in the second row when it is slid forward for access to the rearmost seats. And that third row is reasonably roomy, providing what may be the most capacious accommodations in its class. The Atlas' second row is offered as either a three-seat bench or as a pair of captain's chairs (for $650 extra), meaning it can seat either seven or six passengers depending on configuration. S models feature cloth seats and a 6.5-inch touchscreen, but they do have Apple CarPlay and Android Auto. The SE shoots for mainstream and adds leatherette upholstery and an 8.0-inch upgraded infotainment system. The SEL tops the lineup with even more features like a moonroof and automatic emergency braking, although a loaded model approaches $50,000. Additionally, an R-Line styling package is available on SE and SEL models to give them a slightly sportier look (but the package doesn't actually improve performance aside from including its own 20-inch alloy wheels). What's under the hood isn't much of a surprise if you're familiar with the VW lineup. Base models utilize a familiar 2.0-liter 4-cylinder turbocharged gasoline engine rated here at 238 horsepower. It's the same powertrain we've seen in numerous other VW products, ranging from the Golf GTI all the way to the large Audi Q7 SUV (with which the Atlas shares very little). That engine, however, is only mated to front-wheel drive, meaning it's not likely to be a big seller in the places where snowfall is a regular thing. That's an odd decision, if you ask us, as it significantly limits the Atlas' appeal—especially as all-wheel-drive market share continues to grow. 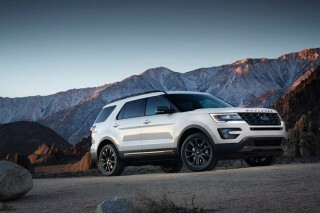 Optional is a 280 hp, 3.6-liter V-6, which comes standard with front-drive and offers all-wheel drive as an option. All engines are mated to an 8-speed automatic regardless of drive wheels. 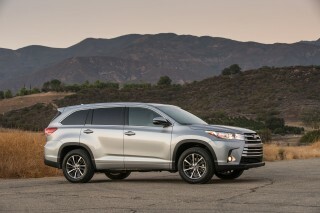 Fuel economy won't be a selling point; the V-6 all-wheel drive model is rated at 17 mpg city, 23 highway, 19 combined, while the front-wheel drive comes in at 18/25/20 mpg. The 4-cylinder rates 22/26/24 mpg. 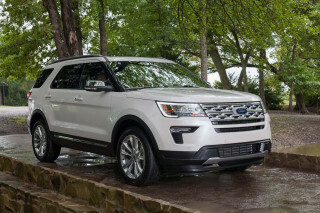 We've only driven the V-6; it's refined and muscular, although it doesn't match the thrust of the optional twin-turbo V-6 in Ford's Explorer Sport. The Atlas rides softly, even on its optional 20-inch alloy wheels, but it remains composed when pushed hard into corners. Ultimately, the Atlas drives well, among the best in its segment, deftly hiding its size and 4,500 pound girth. What's missing, and what should have set the Atlas apart from its rivals, is a turbodiesel option. After VW admitted to cheating in the EPA's emissions testing, the automaker pulled the plug on diesels here. While there's a remote chance of a compliant diesel showing up in the automaker's lineup in the future, we aren't holding our breath. Crash-test scores are good, but not great. Advanced safety features like adaptive cruise control, automatic emergency braking, and lane departure warning come on the SE with the Technology group and the SEL, but aren't optional on the SE. One standout safety feature is the company's post-collision braking tech, which automatically holds the brakes after a collision to prevent the Atlas from moving if it is hit by a second or even third vehicle. Conservative all around, the 2018 Atlas looks muscular and generally hides its girth well. With its broad stance and wide fenders, the Volkswagen Atlas' appearance mostly lives up to its nameplate—at least outside. Inside, it's simple and intuitive, but not especially memorable. Up front, a wide grille (that, frankly, looks like it could have been made by Brinkmann) extends into standard LED headlamps, a nice touch. Below, a faux skid plate adds a touch of ruggedness certainly not backed up in the Atlas' actual ability to explore parts less-known. From the side, it's more interesting, with a distinctive line that runs from the headlights and up over the fenders, accentuating an imagine of girth. At the rear, it's a little more generic aside from a nice swathe of chrome trim that runs between the tail lamps. SEL Premium models come standard with 20-inch alloy wheels, while unique black wheels the same size are offered for an extra charge on SELs. Inside, the Atlas has clean lines, but is very conservative. If not for the big 8.0-inch infotainment system hidden behind an unfortunately fingerprint-showing glass screen, it could have come out a decade ago or more. Everything is arrayed where you might expect, but there's a distinct lack of flair—even on the pricey SEL Premium, which only includes faux wood with an odd sheen and leather seats that feel more like the vinyl standard on all but the base S trim. SE models feel more price appropriate than the SEL, which is priced on top of genuine luxury-grade crossovers like the Acura MDX. The Atlas won't win a drag race, but it drives smaller than its hefty size might suggest. When it comes to crossovers, especially those with seating for seven, it's safe to say that performance doesn't sell. But the Atlas could change that, with driving dynamics above class average and a generally refined feel. A 2.0-liter turbo-4 is standard on all models, although it's not available with the S Launch package or the SEL's Premium equipment group. Essentially the engine used in the brand's Golf GTI hot-hatch, the 4-cylinder is rated at 235 hp and 258 pound-feet of torque, sent to the front wheels via an 8-speed automatic. Oddly, there's no all-wheel-drive version of the Atlas with this engine, a surprise given basically the same motor is hooked up to all four wheels in other VW Group products like the Audi Q7. We've not yet driven the 4-cylinder Atlas. The V-6 should account for the bulk of sales. It's paired with standard front- and optional all-wheel drive and utilizes the same 8-speed automatic. At 276 hp and 266 pound-feet, it's a bit behind some rivals, a fact exacerbated by its hefty 4,500 pound curb weight (with all-wheel drive and no options). The V-6 makes a smooth, almost silent companion, but it requires a good stab at the gas pedal with a few passengers aboard. Underneath, the Atlas makes use of VW's scalable MQB architecture; that sounds like jargon, but what it really means is that it's actually vaguely related to the brand's much smaller Golf GTI. It doesn't drive like one, but it is composed and refined even when hustled hard into a corner. The Atlas' fully independent suspension soaks up bumps with aplomb and isn't upset by undulating terrain. It is confident and poised. All-wheel drive models have several traction control settings for dirt and winter, and all models feature user-configurable steering and drivetrain settings. The steering can be adjusted for a little more heft, while the transmission can be programmed to kick down a little faster. It stops well short of being entertaining, but there's something to be said about its overall composure. The Atlas isn't meant for off-road use beyond on occasional dirt road, but it does offer a solid 8.0 inches of ground clearance. With the optional factory-installed towing package on V-6 models (it's included on SELs), it's rated to tug a hefty 5,000 pounds. Without that package and a dealer-installed hitch, which doesn't include extra engine cooling, the Atlas is rated at 2,000 pounds. We've not yet tried to tow with one, but 5,000 is a big figure for this segment. The Atlas is tops in its segment when it comes to second- and third-row space and access. 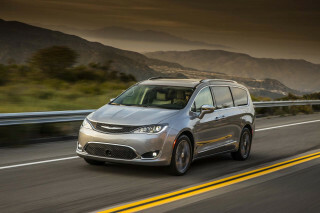 When it comes to crossovers, comfort and convenience weigh heavily. All versions come standard with seating for seven, including a second row bench and a third row that folds away at the tug of a lever. Captain's chairs for the second row are on the options list for $625. S models include cloth seats, while SEs and SELs come with leatherette that does a decent job of imitating real hide but is a bit toasty after sitting in the sun. The SEL Premium package includes actual leather, but it's not a particularly soft grade like some rivals include. Front seat passengers have large thrones that offer particularly good leg support thanks to a cushion that stretches unusually long. The second row delivers crossed leg space and includes backrest adjustment and can be moved fore and aft. It splits in a 60/40 arrangement for longer items, and it pushes forward easily for access to the remarkably spacious third row. Bonus: a child seat can be left in the Atlas' second row even when it's tipped forward for access to the back. For families with at least a couple of kids, this is a huge feature. We haven't yet experienced the optional second row captain's chairs, but they're promising since they offer the same tip-forward convenience plus the ability for kids to slide in between the two seats. That third row is actually tolerable for full-size adults. The cushion is low to the ground and the rear windows are high up, but for even a couple of hours, an average-size adult can sit back there and be fairly comfy. It's one of the Atlas' biggest selling points for families that routinely carry a full load of passengers aboard. And it's a good distraction from what's otherwise a ho-hum interior. Up front, there's a nice stitched-looking top to the dashboard, but that's about where the interesting materials stop. The front doors have some soft-touch surfaces, but not the rears. 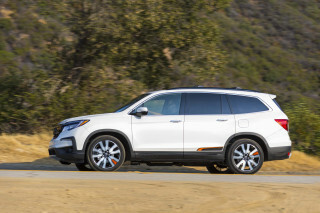 The overall feel is acceptable around $35,000 but a big step behind much above that, especially since an SEL is priced like an Acura MDX that has nice leather and real wood trim. Both the 18- and 20-inch tires let in a lot of road rumble, especially in the second row. We'd like to see VW fit more sound insulation here since there's little wind or engine noise; a quieter ride would help the Atlas feel more like it's worth its fairly hefty sticker price. The 2018 Atlas earns good, but not great, crash-test scores. The IIHS says the 2018 Atlas earns "Good" scores in all relevant tests, but its headlights are rated "Marginal." That means it's a Top Safety Pick. The NHTSA says the Atlas is rated at five stars overall, but driver front-impact protection is four-star worthy. All models come standard with a rearview camera and post-collision braking that automatically holds the vehicle in place after it detects a wreck. Additionally, expected features like six airbags, anti-lock brakes, and stability control are, of course, part of the package. Atlas SE and above models have an upgraded rearview camera with dynamic guide lines to aid backing up. Sadly, VW hasn't followed Toyota's model of making some important features standard, but for around $40,000, the SE's Technology Package includes automatic emergency braking, lane departure warnings, adaptive cruise control, and an auto-dimming rearview mirror. Those features are standard on the SEL. All models offer decent outward vision with relatively narrow roof pillars and a belt line that's on the high side but doesn't seem to get in the way. Over-the-shoulder visibility rearward is also good, aided by headrests that tuck down low when not in use. The Atlas is pricey for what it is, but it's tops in tech and warranty. Although it's cheap at the bottom end, the Atlas approaches luxury-grade pricing but not a high-end feel once a few desirable options are lopped on. It's available in three basic trims—S, SE, SEL—with a handful of option packages. The tl;dr version? The one to buy here is the Atlas SE with the Technology Package, which includes some important family-oriented safety tech that's now standard on a few rivals. With a V-6, all-wheel drive, and captain's chairs in the second row, it's $40,440. The Atlas S includes a 6.5-inch infotainment touchscreen with Apple CarPlay and Android Auto capability, six speakers, cruise control, LED headlights, and the expected power windows and locks. It starts at $31,675, including a mandatory $925 destination charge. A V-6 engine adds $1,400, while all-wheel drive (which requires the V-6) bumps that figure to $34,875. From there, the high-volume Atlas SE 4-cylinder, front-wheel drive stickers for around $34,500 with automatic headlights, rain-sensing wipers, blind spot monitors, rear cross traffic alert, a proximity key, synthetic leather seats, a power driver's seat, heated front seats, and three more USB ports (for a total of four). The SE doesn't include the moonroof, which explains the price difference between it and the Launch package. An optional SE Technology package adds $2,000, but includes valuable features like automatic emergency braking, lane departure warnings, adaptive cruise control, automatic climate control, and an auto-dimming rearview mirror. 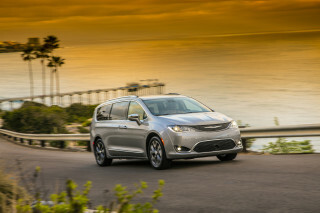 Topping the lineup is the SEL at more than $40,000, which brings back the power panoramic moonroof, plus a power tailgate, an 8-way power passenger seat, memory for the driver's seat, front and rear park distance control, and a trailer hitch. The SEL is optionally available with a Premium package that tops out around $50,000. It adds leather upholstery, navigation, power-folding outside mirrors, heated rear seats, a heated steering wheel, a Fender-branded audio system, ventilated front seats, a surround-view camera, 20-inch alloy wheels, and a trick 12.3-inch, multi-configurable screen that replaces the conventional instrument cluster. On SE and SELs, captain's chairs can replace the three-seat rear bench for $625. Regardless of trim, the Atlas comes with a generous warranty from Volkswagen. Its comprehensive warranty covers the Atlas for 6 years or 72,000 miles, whichever comes first, and is transferable beyond the first owner. 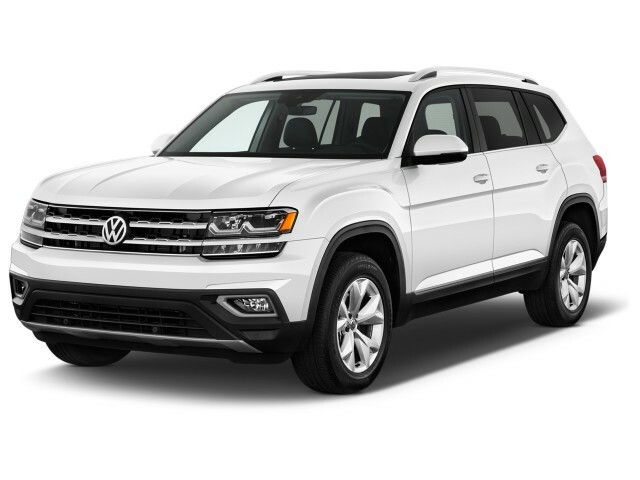 At just 19 mpg combined, the VW Atlas does not move the bar forward in terms of fuel efficiency. The most popular configuration of the 2018 Volkswagen Atlas offers some of the worst fuel economy in its class, something that's hard for us to ignore. That's because the Atlas V-6 with all-wheel drive, which should be the best seller, is EPA-rated at 17 mpg city, 23 highway, 19 combined. The story's a little better with front-wheel drive: 18/25/20 mpg. The 4-cylinder is rated at 22/26/24 mpg. To its credit, the Atlas comes standard with a start-stop system that cuts out the engine at traffic lights to save fuel and reduce emissions. The system works silently, but it also dials back the air conditioning compressor, something you'll notice on a hot day. This crossover also runs on regular unleaded fuel, which helps save a few bucks at the pump. But of course VW was hoping for a different story here; the Atlas was largely conceived and developed prior to VW's admission that it willfully cheated emissions tests with its turbodiesel engines in the U.S. Such an engine could have elevated the Atlas to 30 mpg—if not more—on the highway. I absolutely love my 2018 VW Atlas! Finally VW came out with this vehicle! It's on the same chassis as the Audit Q7 and the Porsche Cayenne but costs $20,000 to $40,000 less! Wow...what a vehicle! test drove this vehicle and it has everything we need without the $75,000 price tag. #1 on our short list to purchase. Handles well, great turning radius. Love the options including the 360 camera. Can tow 5,000 lbs. Test drove this car. Disappointed with the value and lack of available options compared to the Mazda CX-9. Lacks the fun in driving and overall room. Does have some nice details. The 4-cylinder fuel economy... Test drove this car. Disappointed with the value and lack of available options compared to the Mazda CX-9. Lacks the fun in driving and overall room. Does have some nice details. The 4-cylinder fuel economy and lack of 4 wheel drive were disappointing compared to the Mazda CX-9 or others. Looking for a different year of the Volkswagen Atlas?